The Planty ring of public gardens surrounds Krakow's entire Old Town historic district since 1822. 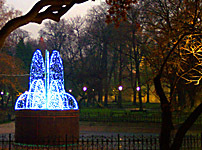 The city of Krakow boasts forty two public parks, including the 1020-acre Las Wolski forest on the range of hills that adjoin the downtown area from the west. Also, there are 334 official city greens. They all total 631 hectares. Visitors cannot miss the Planty ring of about 30 gardens since it encircles the Krakow Old Town central historic district. Its leafy alleys and flowerbeds replaced Krakow’s once awesome city walls in the 1820s. At the same time the natives prefer the 22-hectare downtown Park Jordana (near the main hall of the National Museum in Krakow) with its recreational facilities from a paddling pond to playgrounds to volleyball and basketball courts. As the park borders on the plethora of dorms alongside three major campuses and the central university library, no wonder it teems with students besides families, kids and mothers with babies. The Park Jordana adjoins also grounds of the Wisla Club, Krakow’s biggest sports organization, with its main stadium, public swimming pools, and hall that seats 1,500. Moreover, the huge Blonia common stretches the full length of both the parkland and the sports grounds. The 120-acre meadow amid bustling downtown Krakow has the legal status of a national heritage. The everyday refuge of joggers, strollers, dog owners, sunbathers, etc.–and an occasional cow–proves ideal for open-air events when necessary, be it a concert, a parade, or a papal mass heard by millions. Krakow’s botanical garden at 27 Kopernika street was set up in 1779 and nowadays boasts some 5,000 plants, both exotic and native. Situated in the city’s downtown, it appears an oasis for traffic-weary residents. Krakow contains also a number of wildlife preserves within the city limits, established mostly for the protection of endangered flora species. 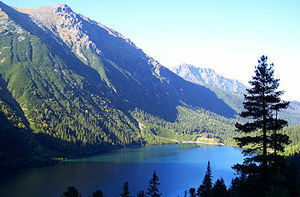 Morskie Oko lake is a must-see of the Tatra National Park 120 kilometers south of Krakow. Copyright © 2001- 20019 by MAREK STRZALA. All rights reserved.